And since beginning this blog a little over two years ago, I have seen so many beautiful Little Flowers groups shared via this virtual community. The effort put into the groups by such lovely mothers is quite inspiring! All in the hope that their little girls will grow in virtue, love of God and genuine Christian friendship! And that was my hope, too. Don’t we all want that for our children? That hope turned into a longing to begin such a group with my own girls, now that they were older. And that longing began to become a reality when I shared the idea with two friends last summer. They were interested enough that the three of us started our own group with our six girls, collectively. We brainstormed ideas and concluded that we would team teach each lesson, alternate host homes, and rotate snacks. Thankfully, there is a wealth of information on various blogs, so we were not without plenty of ideas. And we invited two more families to join us for a total of eight girls and five moms. All of the girls in our group are in Kindergarten through second grade. Our first meeting for Wreath I was in January. And we decided that for this first year (It is a four-year program. ), we would meet twice per month through the month of June, so that we can begin Wreath II in September 2011 and thus begin meeting once per month during the school year(s). The first virtue that we learned about was faith. It is the center from which all the other virtues grow. 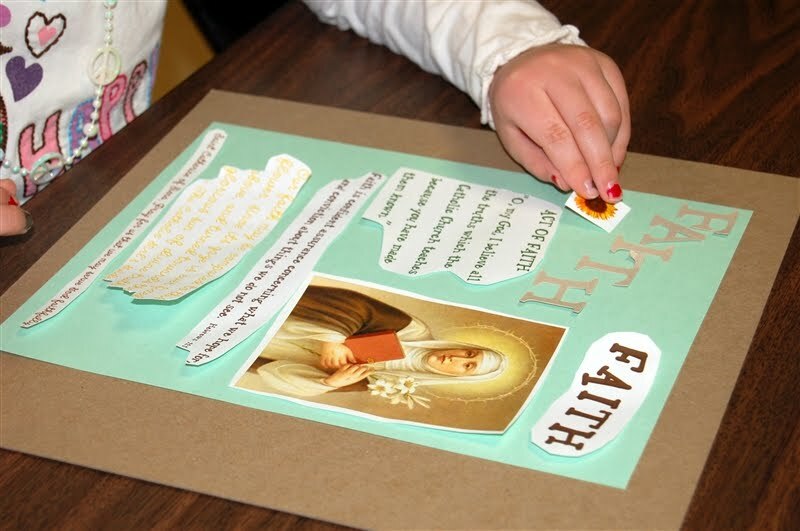 We learned about St. Catherine of Sienna. And how the sunflower is a symbol of faith because it always faces toward the direction of the sun. Just like we are called to always face the direction of the Son. We decided to have the girls make notebooks, with a scrapbook-like page for each virtue. We are using the lovely templates that Jessica at Shower of Roses created and shared so generously. Although we are still very new to this entire experience, as moms, we already have seen the fruitful blessings of this group. For our daughters. And for us as well. This is something that we can do with them and for them. It is something to share. Mothers and daughters. It encourages friendship. Especially for the girls, sisters in Christ. But also for us, as moms, as daughters of God ourselves. This Little Flowers group. It is a true gift. Faith is confident assurance, concerning what we hope for and conviction about things that we do not see. Thank you so much for letting me know about this post, as I haven't been able to visit blogs much lately. I am so happy that your girls now have a Little Flowers group of their own… Little Flowers has been such a blessing for my girls/family, I am sure it will be for yours as well! 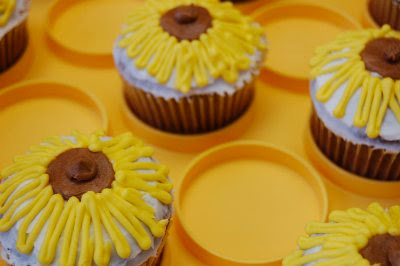 Love the cupcakes… They look too beautiful to eat!!! well now, you have inspired me! when my girls are old enough I want to start one too!!! We create little paper craft kits that include permission to photocopy for your whole group. 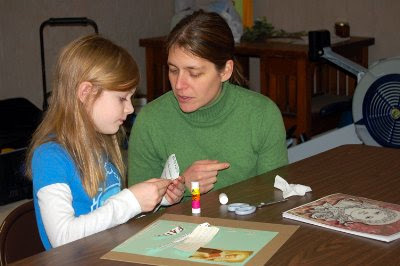 We have had many Little Flowers groups using our crafts and activities…especially the Spiritual Bouquet of Prayer Petal Flowers. I hope that this is more helpful than just a shameless plug =). I am beginning a LF group in a few weeks. I am looking for ideas on ice breakers or games to begin the first meeting. 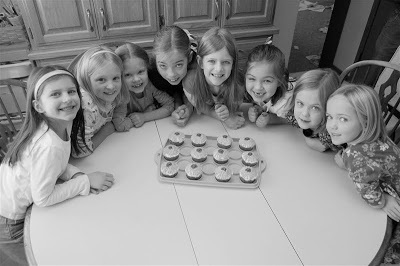 The girls are ages 5 – 8 and some of them don’t know each other. Any ideas please? Hi Jenny! Hmmm … I don’t have a very good collection of ice breakers/games, especially for that age group. But perhaps they could fill out a little questionnaire about themselves beforehand and you could put together a Bingo card with some of the answers. (i.e., find someone whose favorite color is purple; find someone who has a dog named Spot, etc.). Then, they can go around and get to know each other while completing their Bingo card … Also, a quick Google or Pinterest search would be helpful. Good luck! I hope your Little Flowers group is a huge blessing for the girls!